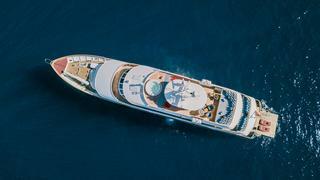 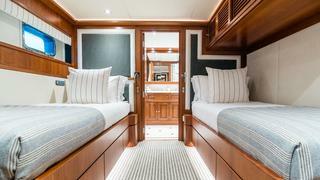 Elegant and well proportioned, CHESELLA accommodates up to 12 guests in six cabins, in an arrangement that features a full-beam master suite, two VIP Suites and two twin cabins – each with an additional Pullman berth. 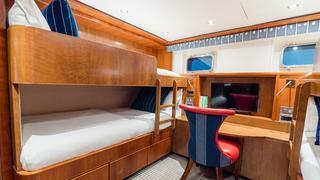 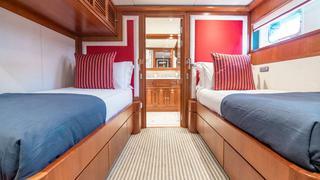 There is also a sixth bunk cabin providing accommodation suitable for both adults and children. 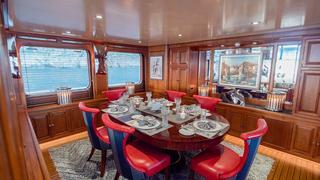 Her interior, completely refurbished using the finest fabrics from Ralph Lauren and other leading designers, creates a state-of-the-art, contemporary yet classic feel throughout the saloon and the formal, 12 person, dining area. 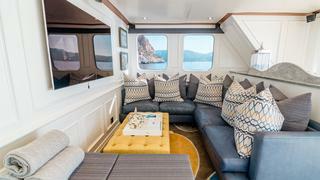 CHESELLA’s sky lounge and snug area offers a great vantage point for enjoying the scenery in climate-controlled comfort. 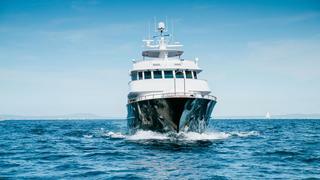 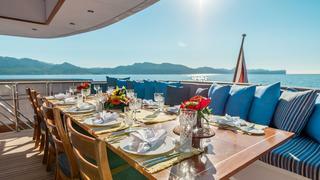 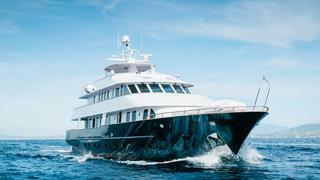 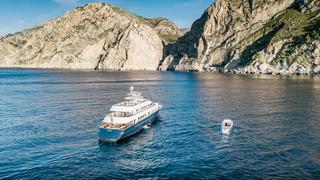 Over her four decks, CHESELLA also offers a variety of outdoor spaces. 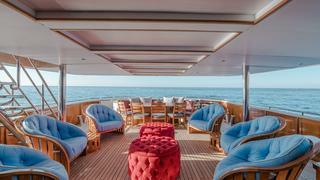 The large main deck is covered and the bridge deck aft area, with its large bank of cushioned seating, is perfect for more casual al fresco dining. 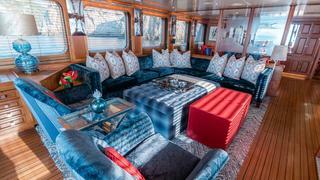 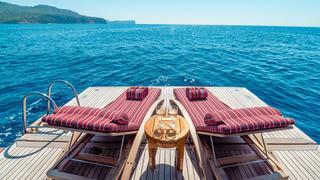 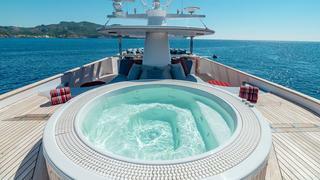 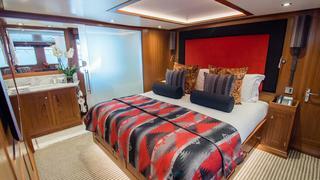 The sun deck features a jacuzzi, outdoor bar facilities and a large cushioned lounge area to aft. 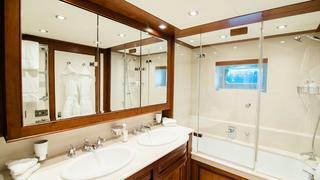 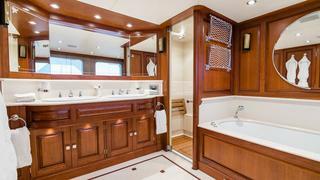 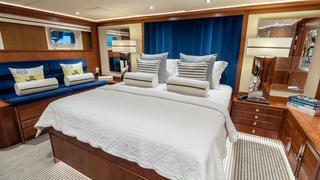 From the aft, the transom door drops down to form a bathing platform on the lower deck. 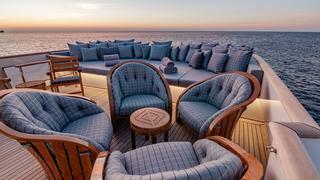 Guests can access the water easily and enjoy moments of contemplation relaxing on the loungers at the water’s edge. 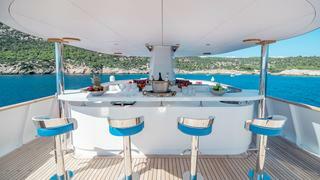 CHESELLA also has a wide selection of water toys, which include a Wave Runner jet ski, diving and fishing gear, and stand up paddle boards, as well as an array of inflatables that can be towed behind her 5m tender. 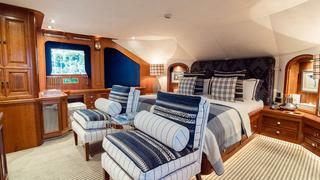 CHESELLA is the perfect yacht for a number of families wanting to charter together in comfort and luxury. 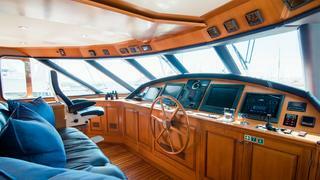 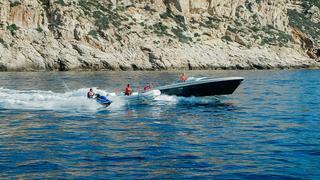 She also boasts an 11m Comitti Venezia chase boat in classic mahogany, hand built in Lake Como.